Five Chinese nationals, including three from the mainland and two young women from Hong Kong have been confirmed dead as of 3 pm local time today, the Chinese Embassy in Thailand said. Another 24 Chinese, including 19 from Chinese mainland, two from Hong Kong and three from Taiwan are being treated in hospital, the embassy said. 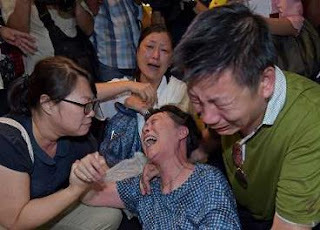 (Pictured, relatives of a Chinese tourist killed in the explosion yesterday at the Institute of Forensic Medicine in Bangkok). In view of the dangers in the Thai capital, Hong Kong’s travel industry said in the afternoon that all tours will be halted until the end of the month. The decision came after the Security Bureau issued a red alert in the morning advising residents to avoid all unnecessary travel to Bangkok. Those already in Thailand were advised to take precautions. Locals fled yet another explosion today at a ferry pier, but no one was hurt, police said. An explosive device was thrown from the Taksin Bridge in the afternoon and blew up at Sathorn Pier after falling into the Chao Phraya River below. Security camera footage shows a sudden blast of water dousing people on a walkway at the pier, as bystanders fled the area. Local media reports said the pier links Chao Phraya River commuter boats and the nearby Skytrain station. It is also a major tourist stop, especially for Chinese tour groups. The Chinese embassy also said today one national is missing. More than 10 others, who sustained minor injuries, have been discharged from hospitals. China “expressed its strong condemnation'' of the bombing in a foreign ministry statement. 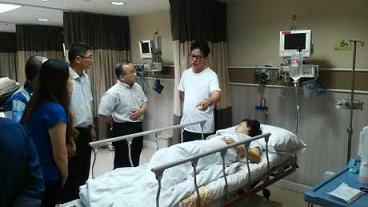 (Pictured, officials of Chinese embassy in Thailand visit an injured national at Samitivej Hospital in Bangkok, capital of Thailand, yesterday). A Thai police spokesman says a man seen in security video wearing a yellow T-shirt and carrying a backpack is believed to have set off the explosion at a central Bangkok shrine that killed 20 people and injured more than 100. “The yellow shirt guy is not just the suspect. 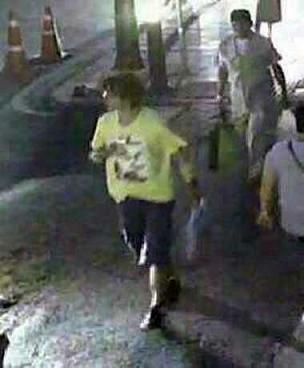 He is the bomber,'' Police Lt Gen Prawut Thavornsiri told The Associated Press. Prawut earlier said the man “is a suspect'' and had released several photos of him, with and without the backpack, on a social media platform. The images were apparently taken from closed-circuit video at the Erawan Shrine before the bombing occurred around 7 p.m. Monday near a busy Bangkok intersection.